Actor Tobey Maguire may play a superhero in the movies, but admits he and wife Jennifer Meyer Maguire needed a lot of time and patience when it came to naming their two children, Ruby Sweetheart, 3 years old, and Otis Tobias, 7 months old. "We didn’t name either of our children before their births," he said on The Ellen DeGeneres Show. "We like to meet them. We talk about it and we have ideas, but we want to kind of react to them." The Spiderman actor also admits that he played a little practical joke on his wife when it came to naming their son. He went to get the birth certificate by himself and came home with a duplicate copy of the form with the name spelled incorrectly. "We spell it Otis, but I spelled it Oatis on the form and brought it back to my wife and was acting very innocent. ‘Oh, Im so excited! Its official! Look,’ and I handed her the paper," he said. Maguire brought a home video of his wife’s reaction to the joke to share with viewers of the show. Needless to say, she was less than thrilled! 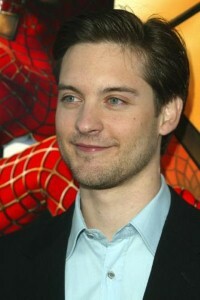 In addition to the Spiderman movies, Maguire has starred in Wonder Boys, Seabiscuit and others. He’s currently starring in the film Brothers in theaters now.